The South African-born billionaire businessman and engineer Elon Musk is one of the world’s leading innovators in space travel. His company SpaceX works on the creation of low-cost and energy-efficient spacecraft. It’s possible that those spacecrafts will bring the first humans to Mars in the following decade. If SpaceX succeeds in its pioneering mission, the name “Elon” will undoubtedly become forever associated with Mars. But this isn’t the first time “Elon” and “Mars” have been linked. Far from it. Wernher von Braun was a German aerospace engineer responsible for the development of one of Nazi Germany’s most advanced weapons, the V-2 rocket. Nicknamed “the vengeance weapon,” the V-2 was the first long-range guided ballistic missile in the world. It entered service in late 1944 and, by the end of the war, over 3,000 V-2 missiles had been launched by the Wehrmacht, killing around 9,000 civilians and military personnel. A further 12,000 forced laborers and concentration camp prisoners died after being forced to participate in the production of the notorious weapon. 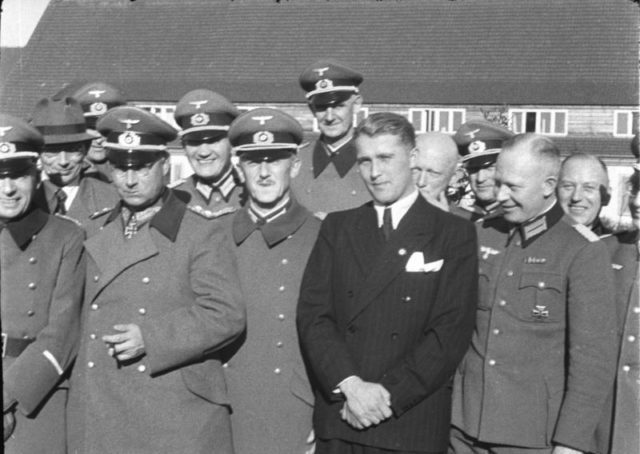 First rank, from left to right, General Dr. Walter Dornberger (partially hidden), General Friedrich Olbricht (with Knight’s Cross), Major Heinz Brandt, and Wernher von Braun (in civil garment) at Peenemünde, in March 1941. Von Braun was an avid astronomer who developed a passion for rockets early in his youth. In 1934, he earned a doctorate in aerospace engineering from the University of Berlin. His doctoral thesis, entitled “Construction, Theoretical, and Experimental Solution to the Problem of the Liquid Propellant Rocket,” was classified by the army and wasn’t made available to the public until 1960. He was immediately recruited by the German army and began developing rocket weapons. Von Braun was stationed at a military research facility in the village of Peenemünde on the shore of the Baltic Sea, where he oversaw experiments with liquid-fueled rocket engines and jet-assisted aircraft takeoffs. 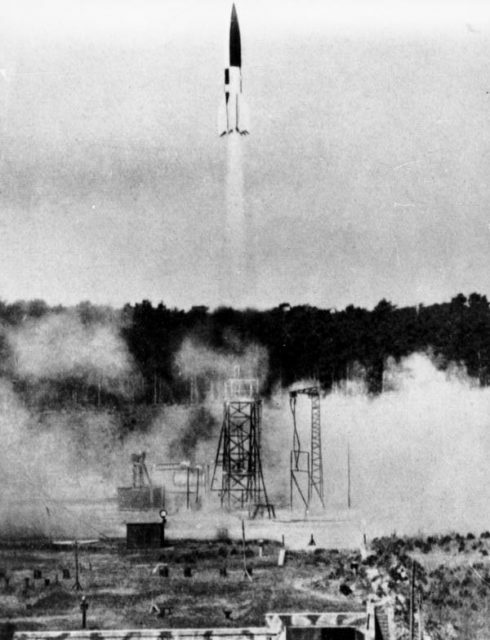 Also at Peenemünde, von Braun developed the supersonic Wasserfall anti-aircraft missile and the A-4 ballistic missile, which was later renamed V-2 (Vergeltungswaffe 2). Although von Braun was aware that V-2 production plants used forced labor and mistreated their workers, he was allegedly unaware of the true nature of the Nazi concentration camps. He reportedly visited a V-2 production plant only once and was satisfied with the treatment of the employees. In reality, forced laborers were regularly beaten and deprived of food, and many of them died from diseases, executions, and appalling working conditions. In 1944, von Braun was accused of secretly cooperating with Communists and arrested by the SS. His crimes against the regime were never proven, so he was conditionally released and continued working on the development of ballistic missiles. However, at that time, he was already plotting his escape to the United States. He managed to escape to Austria and surrender to the U.S. Army in the spring of 1945, at the time when the Soviet army was approaching the research facility at Peenemünde. 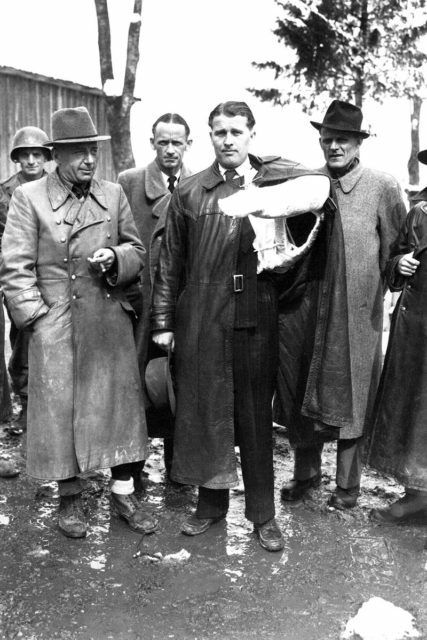 Von Braun, with his arm in a cast from a car accident, surrendered to the Americans just before this May 1945 photo. Von Braun was among the 1,500 German scientists who were secretly transported to the United States. Since he was a pioneering scientist who expressed disgust towards the Nazi regime and its horrible genocidal policies, he was quickly employed by the U.S. Army and started developing ballistic missiles. 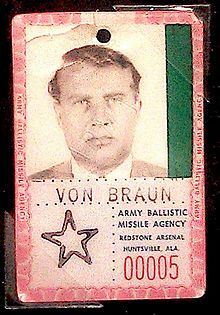 Although he spent the first half of his life developing weapons, von Braun’s true passion was space travel. He was interested in developing jet propulsion systems that could transport manned rockets to the moon and to Mars. He got a chance to pursue his lifelong dream in 1957, but before that he published several theoretical and fictional works that theorized the colonization of Mars and the construction of a space station in the Earth’s orbit. His writings on the construction of a space station inspired the design concepts of Stanley Kubrick’s 2001: A Space Odyssey. Von Braun’s work, The Mars Project, published in 1952, was somewhat megalomaniacal but also strangely prophetic. The book proposed a manned mission to Mars that would result in the planet’s colonization and the establishment of an autonomous government there. The mission would include a fleet of 10 massive spacecraft which would transport 70 astronauts and nine crew vehicles. 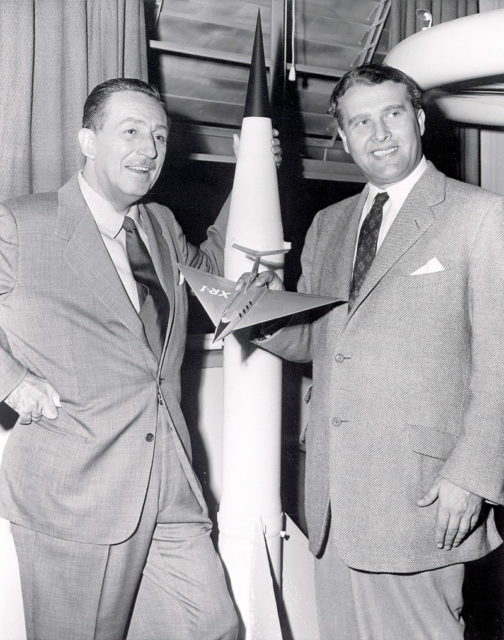 Braun made detailed calculations of all the aeronautical and engineering parameters of the mission but, although his grandiose plan attracted the attention of some wealthy people interested in space exploration (including Walt Disney), it remained purely theoretical due to technological limitations of the 1950s. 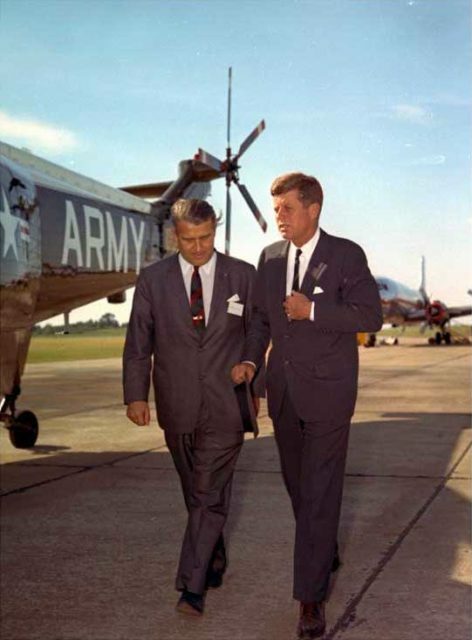 Von Braun with President John F. Kennedy. In the 1950s, the proposed title of “Elon” had no particular significance. It was likely derived from the Hebrew name “Elon” which means “oak tree” and signifies great knowledge and wisdom. Now, with the news of Elon Musk’s plans, people are wondering if this could be just a coincidence. There are no connections between von Braun and Musk, who was born in 1971 in Pretoria, the son of a Canadian and a South African. He taught himself computer programming by the age of 12, and earned university degrees at the University of Pennsylvania and the Wharton School of Business. 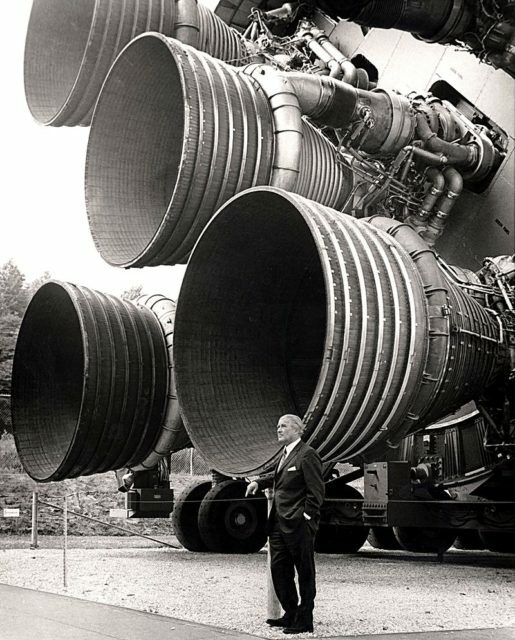 Von Braun with the F-1 engines of the Saturn V first stage at the U.S. Space and Rocket Center. Although von Braun never managed to pursue the fabled colonization of Mars, he did become a pioneer of American space travel. Namely, he was the mastermind behind the Saturn V, an expendable liquid-fueled rocket that was in use from 1968 to 1972. The rocket was the only vehicle in history that launched manned capsules beyond low Earth orbit. 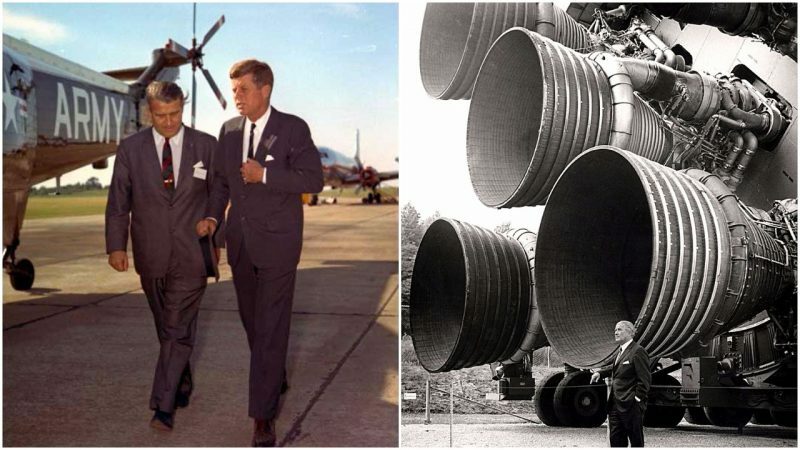 Saturn V was used in all the Apollo missions, and, despite his grim history of working for Nazi Germany, Wernher von Braun will always be remembered as the man who revolutionized space travel and helped send humans to the Moon.